don’t bake too often, so I never heard of these soufflé cheesecakes before I saw Yvonne Ruperti’s recipe over at seriouseats.com. They are insanely popular on the internet! Cream of tartar is the powdered form of tartaric acid, a substance that forms at the bottom of barrels when making wine. It is used mostly in recipes for cakes as a leavening agent (often in combination with baking soda), as a stabilising agent in case of whisking egg whites or helping prevent sugar to crystallise in frosting. It is not commonly available in supermarkets in the Netherlands, so you have to revert to online baking shops or to mini markets with imported products from the US/UK. After some browsing, it seems that using white vinegar or lemon juice is a decent substitute, but others advised to omit the cream of tartar altogether. I tried this one with lemon juice. Fit a stand mixer with a paddle attachment and beat the cream cheese, butter, 2 tablespoons sugar, and salt on medium speed (about 2 minutes) until very creamy. Beat in egg yolks and lemon zest until smooth (about 30 seconds). Replace paddle attachment with whisk attachment. Whisk in the lemon juice and sour cream on medium speed until combined. Sift the flour and cornstarch over the batter and whisk until completely combined. Transfer mixture to a large bowl. Thoroughly wash and dry stand mixer bowl and whip egg whites and cream of tartar on high until frothy. Slowly pour in the remaining sugar and continue to whip to medium-peak stage. Fold a third of the meringue into the batter with a rubber spatula until almost combined. Gently fold in the remaining meringue in two more batches. Pour the batter into the springform pan and set on the oven rack. Pour about 2″/5cm hot water into the roasting pan. Bake until the cake is golden and just firm in the center, 40 to 45 minutes. Remove roasting pan from oven and keep it in the water bath for 30 minutes. Set on wire rack to cool for another 30 minutes, then chill in the fringe until fully set, about 3 hours. As you can see, cutting it up and serving it with a spatula instead of properly getting it out of the silicone mould made it look a bit rough around the edges. 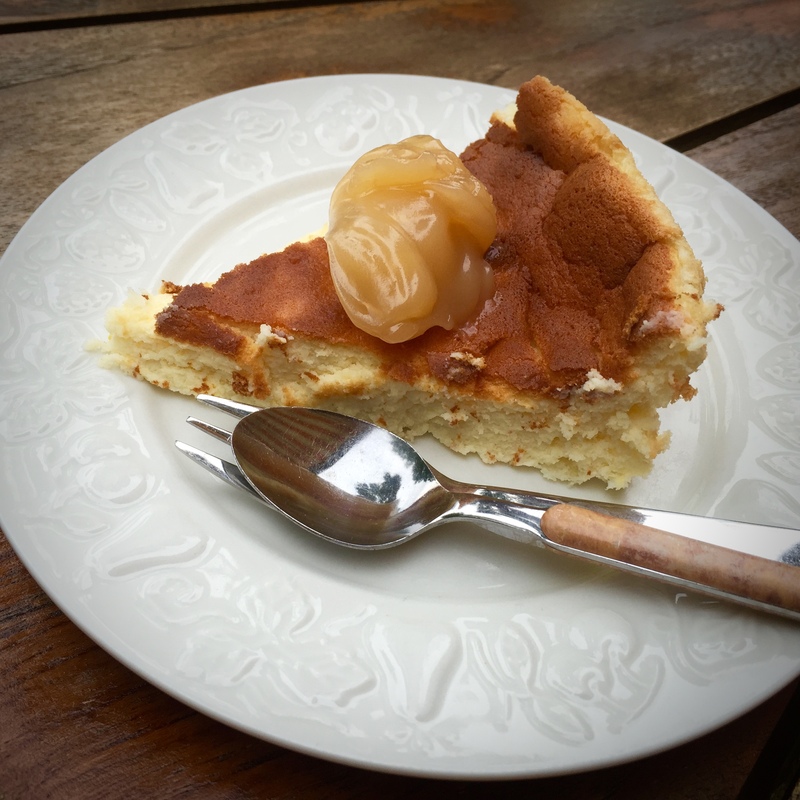 The cheesecake did “deflate” a bit whilst cooling down (after all, it is kind of an huge soufflé), but there was some consolation from the experiences found online that deflation is a common phenomenon (phew…). It tasted amazing though. The slightly denser structure was not a problem at all as it still was not overpowering. Not very surprising as it only has about a third of the cream(cheese) compared to regular cheesecakes. We didn’t miss the usual crumble base either, so seconds were served (almost) guilt-free.